The website design is just the beginning! Once your website is launched, you need to continuously update it with content helpful to your target market. If you want to create more content for your B2B website, the easiest way is by blogging. Blogging is an excellent way to position your firm as a thought leader and convey some personality about your company. Bop Design manages your blog by creating original, timely, keyword-rich content that excites your target market. If a B2B firm uses regular blogging as part of its marketing strategy, it transforms a B2B website from a static brochure into a “living, breathing” resource center for current and prospective clients. The Bop Design team excels at creating content that helps improve SEO and attracts clients you want to do business with. This continuous output of content helps generate inbound digital marketing leads from your website. Your firm can’t be everywhere all the time! Outbound marketing tactics like networking can be an effective but slow method to generate B2B leads. Blogging can be a more efficient inbound marketing substitute to attract the right prospective clients to your website. Once there, a visitor sees the professional website design paired with compelling content and has greater interest in connecting with your firm. As a B2B company, your primary responsibility is delivering top-notch service to your clients, but we consistently hear companies say they can’t find the time to write and manage a blog. Bop Design can help you better focus on your clients by taking the blogging off your plate. Bop Design will discuss industry trends, new advancements, recent legislation, upcoming events and more to identify blog topics relevant to your target audience. We then find an effective mix of amplification channels—such as social media, news syndication, multimedia and email newsletters—to reach clients, prospects and partners. Content and social media marketing are proven ways to increase brand awareness, attract the right traffic to your website, build up your authority in your industry, generate new leads, and nurture existing leads. 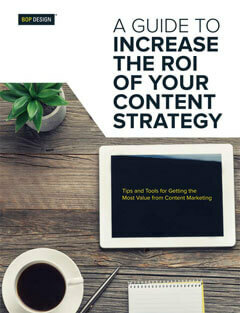 Download a Guide to Increate the ROI of Your Content Strategy to evaluate and maximize your marketing efforts. Every B2B website needs to be a living, breathing resource center. The blog is the best place to be continuously adding helpful content to position your company as a thought leader and keep visitors on your website. Bop Design has helped create and implement a blogging strategy for the following industries.